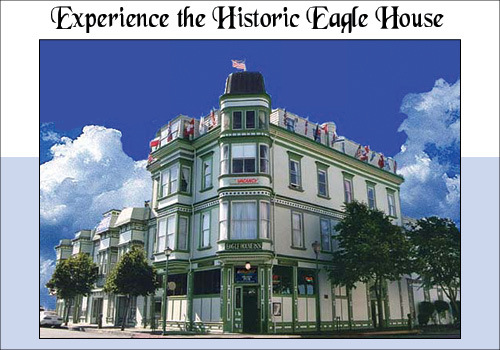 Year ago the Eagle House was used as a sort 0f mini-mall, with boutique stores off the upper balcony. On a ghost tour I was told the building to the left was originally on the corner and they moved it to construct the bigger building. The potential legalization of marijuana is a very hot issue right now… Kym Kemp (AKA Redheaded Black Belt) maintains a blog that touches on this topic quite frequently. According to a random timeline of Eureka I just found on the internet, this grand old building was destroyed in an 1954 earthquake. Please don’t misunderstand. I think this is actually a gorgeous photo of a very ugly building… more a hodgepodge of four buildings all kinda mashed together, actually. One can’t help but notice the different “feel” of the old building . And I can’t help but wonder if the character of Eureka would be different if this historic structure was still standing today.